This memorandum is part of an ongoing effort to help school employers assist their employees in completing the fingerprint process before the transition to the Statewide Vendor Managed System with MorphoTrust in July 2015. 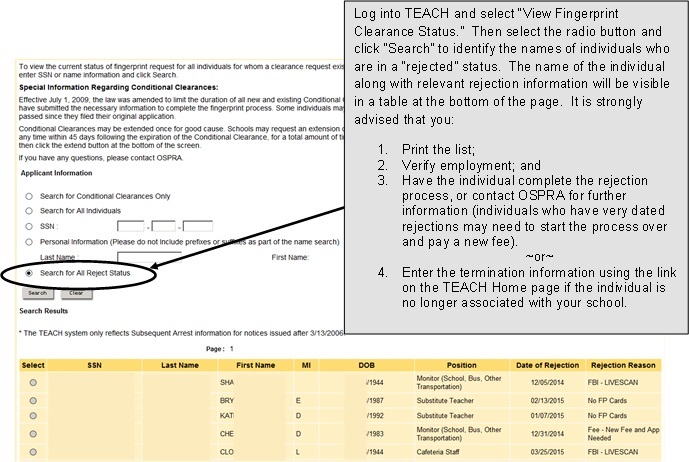 To assist in this process, the New York State Education Department developed a “rejection” report in the TEACH System. Below is a screenshot with detailed instructions on how to obtain information about individuals who have not yet completed the fingerprint process. Please note that failure to successfully complete the fingerprint process before the transition will necessitate the commencement of a new fingerprint application along with the payment of all applicable fees. Fees associated with incomplete fingerprint applications are not eligible for a refund and cannot be credited towards a new application. Please contact OSPRA at ospra@nysed.gov or (518) 473-2998 if you have any questions.